Under the Marine Corps tuition assistance funding TA you could be eligible for up to $4500 per fiscal year in tuition reimbursements ($250 per semester hour). The process to quality is easy and you'll need to follow the following steps. After finding the school you want to attend and requesting information to make sure the school is a good fit you'll need to attend a TA orientation class if you are new to taking courses. You will then need to fill out the NETPDTC 1560 form. This TA authorization form need to be completed and submitted prior to enrolling in the school. The school you have selected will then coordinate the rest for you and be in contact with you and TA so the process runs smoothly. In additional to TA you may want to look into other education funding sources/scholarships available to you. Most of the funds are in addition to the $4500 you already receive in TA. The Marine Corps College fund is funding where you can receive up to $50,000 for college if you have completed 4 years or more on active duty. The STAP programs offers spouses up to $1500 per year to be used for college including programs in vocational trades and certificates for those who don't want a degree. For spouses be sure to check out MyCAA as they cover up to $4000 in education benefits. Along with the TA you'll be receiving the GI Bill® also provides a stipend for students not living in military housing, be sure to ask your school how you qualify. Also the GI Bill will pay for up to $1000 in books and supplies needed for your degree as well as $100 for tutoring. 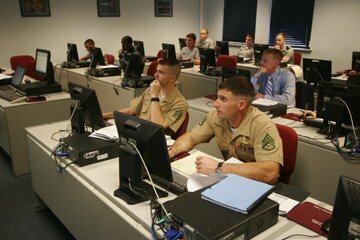 If you are a Marine and interested in taking a program in a high-tech field like: Computer Science, Mathematics and Engineering you could be eligible to receive a lump payment for your education. Programs that would qualify include: electronics, computer science, nuclear technology, telecommunications, weapons, bio-technology and aerospace. It is important to note that if you do not pass the class you will be responsible for paying back any funds back to the Accelerated Payment Plan (APP). There are many marine education programs that have been made available for those who are on active duty or veteran. These programs have been approved by the Department of Defense and are available to those who qualify. We recommend you visit your ESO officer today at your base for more information on how to take full advantage of the educational benefits available to you and even your spouse. Do you want a degree but don’t know that to take? This is a common problem as there are so many schools to choose from. It really depends on what you are looking for and what you want to accomplish. Do you want to stay in the service for an extended period of time and are using the educational benefits to increase your pay rate? If so then we recommend a degree program as it will take you 2-4 years to complete and this will help you gain rank and pay while in the Marines. If you are considering leaving the service and have less than 2 years remaining then we recommend a certificate program. These programs require less time and give you the experience you need to get a job once you leave the service. The great thing about how tuition assistance works is that you can take full advantage of large amounts of money available for education with almost limitless possibilities. You served your country for years and you deserve to take full advantage of the services available to you and your family. Schools that specialize just in servicing the military is a good option as they know what your daily life consists of and understand the stresses that come with your job. Why not get the best of both worlds? Take a course(s) that allow you to further increase your pay while in the military but also give you the experience to get a job if you decide to leave. Several schools offer a combo package that will allow you to do just that. Your benefits as a Marine always change and tuition assistance options are no exception. If you are married your spouse might be eligible to attend school using the same tuition assistance plan offered to you. This is amazing and allows your spouse to start a new career. Don’t spend countless hours wishing you were enrolled in a school. In after 4years of service you haven’t taken advantage of what is offered to you it would be a shame and we want you to succeed. If you have any questions regarding what school to attend we urge you to e-mail us so we can assist.